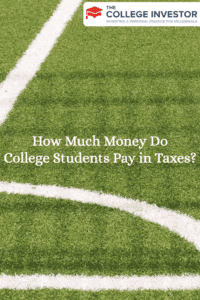 Home » How Much Money Do College Students Pay in Taxes? When you think of your time in college, you think of tight budgets, eating ramen noodles, and fun parties. You don’t think about taxes. But the truth is, most college students do pay taxes. How much do they pay? Well, that’s an interesting question that I wanted to tackle this week, since it is tax season. The scholarship winner: This college student is in college on scholarship, and focuses 100% of his time on his studies and sports. No working. The student worker: This college student is working through college, and took out some student loans to pay the difference. The college entrepreneur: This college student is hustling through school, earning good money, and not taking on any debt to pay for school. 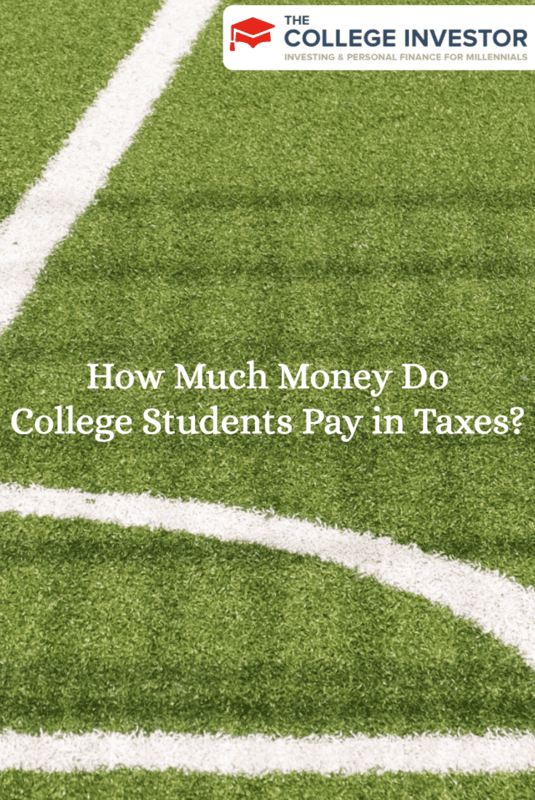 Let’s look at how much each of these students should end of paying in taxes each year. The scholarship winner has the best tax situation of all college students. For the most part, as long as the scholarship money is used to pay for tuition and required fees, books, supplies, or equipment, the money is tax-free. As a result, the student will not typically have any income that needs to be reported. The only exception is if the student has some type of taxable investment account — then there could be some tax liability. In this case, it still would make a lot of sense for the parents to claim the student as a dependent on their returns. The student worker is what I think every college student should aspire to be. Yes, you will pay taxes, but you’ll earn money that can help pay for school and life — minimizing the amount you need to borrow. This was my situation through college, and so I thought it would be helpful to take a look at how much a student worker could make, and how much they will pay in taxes. My freshman and sophomore year of college, I earned $21,000 working, and I also earned about $3,000 investing. Both years, my adjusted gross income was around $24,000. Since I was in college, I rented and took the standard deduction. I also qualified for an education tax credit worth $1,010. My total tax due after everything was $666 (scary right?). My junior year of college, I was a baller and boosted my adjusted gross income to $27,000. I took all of the same deductions, with the education tax credit being worth a little more, and my total tax due was $864. By my senior year of college, I had really been focusing on my hustling, and I got a job right out of school — so the whole second half of the year was at a full-time salary. My wages increased to $40,000, and I also had investing gains while in school of $20,000 that year. My hustling became official that year, and I had $2,000 of side-hustle income. As a result of the higher income, I was able to take a bigger tuition deduction, and my adjusted gross income ended at $58,800. My total tax due my senior year was $6,923. I ended up owing a lot at tax time because a lot of my income was due to investing and my side hustle. I think college entrepreneurs are heroes — that’s why I love sharing stories of college students making $100,000 or more, and my young millionaire series. However, college entrepreneurs will also pay the most taxes of any students. The reason? Entrepreneurs are forced to pay self-employment tax as well as traditional income taxes. Let’s go back to my experience as a student worker, and simply change the numbers to self-employment income instead of wage income. That will show the difference well. If the college entrepreneur earned $24,000 in their business, the student would be able to deduct $1,836 from their earnings due to the self employment deduction, but would still owe an additional $3,391 in taxes. You would claim the same deductions as above, including the education tax credit, and you would still owe $2,391 in taxes. A lot more than the $666 I paid just being a student worker — even though we earned the same amount. Let’s say you’re a very successful college entrepreneur, and you earned $60,000 per year while in school. In this situation, you’d owe an additional $8,478 in self-employment taxes, and it would bring your total tax due to $13,351. Ouch — especially for a college student. All of these investing options help reduce the amount you pay in taxes because you can contribute your money pretax, meaning you’ll take a tax deduction for the amount you contribute, up to the limits of each plan. That can help you save in taxes. I worked a part-time job in college and they offered 401k plans to part-time workers. I bit the bullet and invested 5% of salary into my 401k. It was very little money and I was OK with that because I was living off of the rest of the income. But that little amount compounded over time and was a nice way to start off my retirement savings.